Discover 2012, Updated Hewlett-Packard is finally ready to make some money peddling infrastructure on its public cloud and to give Amazon Web Services a little competition. As part of the Discover 2012 customer and partner extravaganza in Frankfurt, Germany on Wednesday, the compute portion of the HP Cloud is coming out of public beta testing and according to Dan Bagent, senior director of business development for cloud services at HP, the compute cloud will have a service level agreement (SLS) with a "3.5 nines" uptime guarantee. That means HP is guaranteeing that it can keep those compute instances up and running 99.95 per cent of the time. If you do the math on that, that works out to a little more than four hours of downtime a year. The SLA, as you can see from the agreement, is not gauged on annual basis, but rather on a monthly basis and is only applied to your bill in a given region where the public cloud is located. So what HP is really agreeing to us no less than about 22 minutes of downtime per month. As the uptime goes down, HP gives you a credit on your bill that goes up as high as 30 per cent if the uptime falls to under 99 per cent. That would mean uptime would be on the order of seven hours per month. The pricing and configuration of the HP Cloud Compute instances are exactly the same as they were under the public beta program, which you can see here, but be aware that the promotional pricing that HP had, with a 50 per cent discount and that is still its official price list in bold, will have its costs doubled on January 1, 2013. On the Compute Cloud, HP is peddling T-shirt sizes ranging from extra small to double extra large, with fees ranging from 4 cents to $1.28 per hour running Linux and from 6 cents to $1.92 per hour running Windows. HP is supporting Fedora, Debian, CentOS, and Ubuntu Linuxes, but not Red Hat Enterprise Linux or SUSE Linux Enterprise Server. On the Windows side, HP had just added Windows Server 2008 SP2 and R2 are supported, and Windows Server 2012 is in the works, says Bagent. The SLA on the Cloud Object Storage, which came out of public beta in August, has the same uptime guarantee as the Compute Cloud. HP is moving its Block Storage service for its public cloud from private beta to public beta, which means the rest of us schmoes can give it a whirl now. It costs 10 cents per GB per month. HP is building its public cloud on the OpenStack cloud control freak, and is using the old "Essex" release and will be soon moving to the newer "Folsom" release that the OpenStack project just put out at the end of September. The compute portion of the HP Cloud is based on the "Nova" compute controller and the Object Storage service is based on the "Swift" controller. As El Reg revealed back in May, that Block Storage service is based on HP's own code. HP is also this week rolling out a private beta of a platform cloud service based on VMware's open source Cloud Foundry framework. More details of this were not available at press time. And HP has also put together a set of workload migration services to help customers move their apps to the cloud, which are also going into private beta this week. 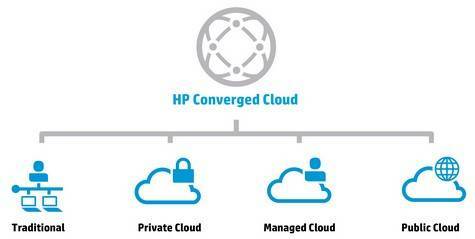 As we have pointed out in the past, HP is building its public cloud based on ProLiant servers running OpenStack, but it has a much more sophisticated – and expensive – setup called CloudSystem, based on its BladeSystem blade servers and a bunch of management and provisioning tools, that it wants enterprises to use to create their own private clouds. CloudSystem is an upgraded version of the BladeSystem Matrix setup that HP created nearly four years ago and that predates OpenStack by nearly two years. The big news this week is that CloudSystem pre-configured infrastructure clouds now support the KVM hypervisor championed by Red Hat. The CloudSystem software, which has its own cloud control freak, already supported the VMware ESXi and Microsoft Hyper-V hypervisors for x86-based ProLiant blades as well as HP's own IntegrityVM hypervisor for blades based on Itanium processors. 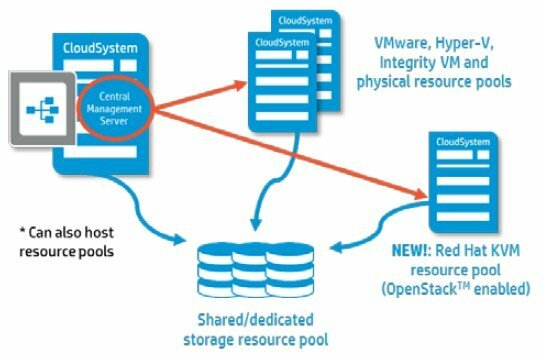 To get KVM support, HP has woven OpenStack into the CloudSystem software stack to give it the management APIs that CloudSystems needs to manage KVM. And the machine supports a very specific implementation of KVM: only the KVM that is embedded inside of the latest Red Hat Enterprise Linux 6.3. So if you want to use the freestanding Red Hat Enterprise Virtualization (RHEV) KVM hypervisor, the one embedded in Ubuntu Server, or download KVM yourself and run it raw, you can't. What you can do is mix and match Hyper-V, ESXi, and KVM on a single set of CloudSystem clusters and have them all managed from the CloudSystem console. The entry CloudSystem Matrix setup includes the ability to manage those hypervisors all built in, creating an infrastructure cloud. If you want to add a self-service portal and application lifecycle management to it using Cloud Services Automation, then you might spend something on the order of 1.5X to 2X the cost of the base CloudSystem Matrix machine to get that, estimates Frances Guida, who is manager of cloud solutions and infrastructure at HP. If you want to get your app dev/test teams hooked into the cloudy infrastructure and automate the promotion of code through the test, QA, and production phases, then the final layer of code you need for the CloudSystem is called Continuous Deliver Automation. This tool has been revved to a 1.1 release this week, and with it administrators can specify (in a generic way) what infrastructure will be necessary to run an app in production as opposed to in a test/dev environment. CDA 1.1 can't make specific hardware recommendations, but rather generic ones. The goal is to eliminate initial performance and capacity planning issues, but human beings still need to monitor the CDA tool. CDA costs $27,000 for a license that manages five distinct applications. Bootnote: As it turns out, HP is not taking the raw Cloud Foundry code to create its platform cloud service, which you can see more about here, but has partnered with ActiveState, one of the several commercializers and extenders of the Cloud Foundry framework, to fluff up its PaaS. Toph Whitmore, vice president of marketing at ActiveState, says that the OEM agreement with HP for its use of the Stackato variant of Cloud Foundry is non-exclusive. While Whitmore could not get into the financial specifics of the deal between ActiveState and HP, Whitmore did say that there is money upfront and then additional revenue beyond that, presumably a cut of the action as customers fire up PaaS instances on the HP Cloud.